An easy recipe for what to cook for dinner with your goose meat. 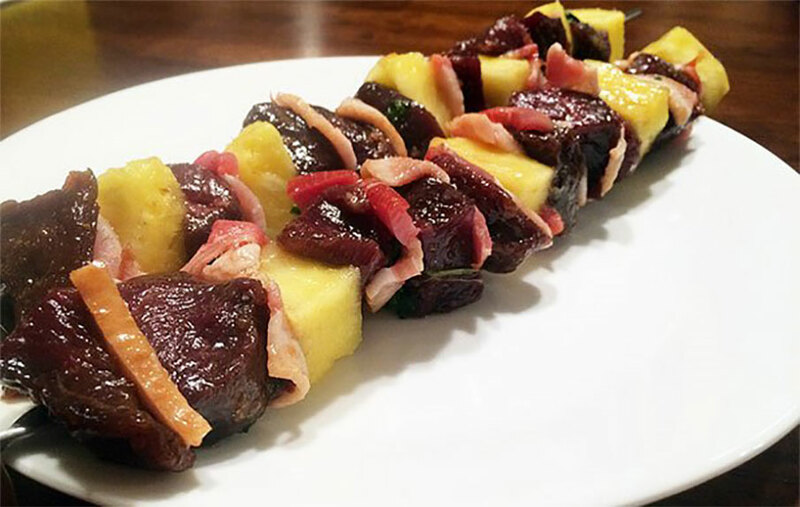 Simplymarinade the goose breast meat with some sweet ingredients and then barbequewith fresh pineapple and a little bacon. Click here for recipe. Goosemeat and sautéed mushrooms served over hot buttered rice or noodles with a dashof paprika. Click here for recipe. Goosebreast meat with fresh ginger, water chestnuts, bamboo shoots and finelychopped cabbage all packed together in a golden brown flaky egg roll wrapper. Click here for recipe. Servethese tasty pot stickers with the Goose Egg Rolls above, along with jasminerice and sweet chili sauce. Click here for recipe. Gooseis stuffed with apples, bread, celery, onion and butter and then roasted untilthe skin is crispy and delicious. Click here for recipe. Adelicious way to cook goose. You can substitute the blackberry jelly withraspberry or other fruit flavor too. Click here for recipe. Thisparticular goose recipe requires 4 hours of marinating before roasting, but itis so worth it! Click here for recipe. Canadagoose breasts cooked with leaks, onions, carrots, and mushrooms in a flaky piecrust. Click here for recipe.